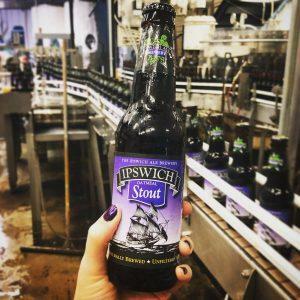 Located in Boston’s North Shore community, Ipswich Ale Brewery has been a bean town classic since 1991, making them one of the oldest craft brewers in New England. 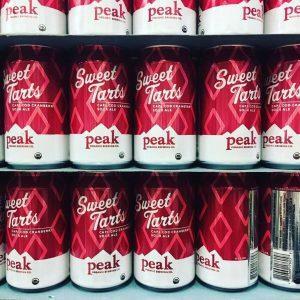 They are a well-known, household name to beer lovers all over Massachusetts and in New England in general. The overall vibe and image of the brand and brewery is just timeless, fun, and classic Boston. It is the perfect environment and brew selection for the exemplary beer lover. 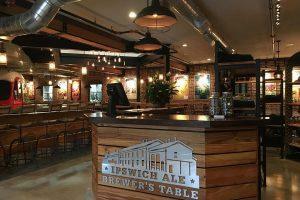 The team at Ipswich Ale Brewery is jam-packed with industry experience and Boston culture. Their president started with the company back in 1994 as just a plain-old volunteer! Over the years, he had worked his way up from delivery guy, productions, and to Director of Operations! In 1999, he bought the brewery and molded and showcased it into the reputable, lovable brand we see today. Now, what you’ve all been waiting for, the beer selections! Ipswich Ale Brewery offers 8 year-round beers at all times. Throughout the year they release 14 different seasonal beers. Along with these, they offer a special 3 types only available on tap at their on-site restaurant, the Brewer’s Table! Here are some descriptions of some classics, limited, and on-site offerings! Make sure to add Ipswich to your list of breweries to visit! Along with tasty brews, you can also grab a bite to eat at their restaurant! Being huge fans of Ipswich Ale Brewery ourselves, we at Mystic Wine Shoppe also carry their year-round and seasonal beers! Make sure to stop in and pick up a pack. You can’t go wrong with this timeless, New England classic! The vibe that Lamplighter Brewing Co. embraces is a modern, funky environment that allows visitors to experience a unique twist on their basic brewery trip. This eclectic brewery, located in in downtown Cambridge, Massachusetts, focuses in quality, community, and craft. With a saying such as “I Love Lamp,” a reference from the comedy hit, Anchorman, it comes as no surprise that this location meets its goal by being a fun, hip place to be. 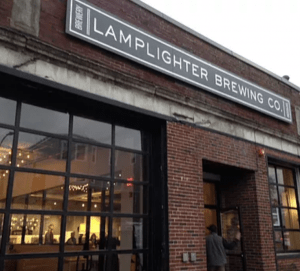 The team at Lamplighter is an energetic mix of different backgrounds in education and expertise who all share a strong passion for producing delicious beer. 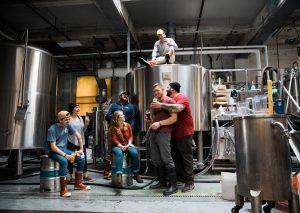 This team makes for a very fun, welcoming environment from the minute you enter the brewery. The space has a very modern, industrial look to it. From the exposed pipes to the classic Boston brick work, this brewery is a neighborhood favorite. Now for the most important part, the beer. All together, Lamplighter creates 44 different types of brews. Impressive, right? Within these 44 unique choices, they focus on aroma-packed and flavor-driven ales, with an emphasis on New England IPAs, barrel-aged sours, and unique seasonals. To help narrow down your possible selection, we’re going to provide you the info on the 13 brews that happen to be on tap today! “Alyosha” Abbey Ale: low ABV, and light body allow hints of fruit and spice to shine, while the addition of wheat and pilsner malts leave each sip soft and approachable. “Brothers Antitoi” Brettanomyces Fermented Wild Beer: smooth and bright acidity is complemented by subtle underlying funk, layered atop flavors of fresh strawberries, ripe pineapple, and candied peach rings. “Cuppa” Brittish Ale with Cold Brew: light and fruity hot bloom roast is added at the end of the brewing process to preserve as much coffee flavor as possible. The finished beer is made up of about 10% coffee. “Finnegan’s Wake” Irish Dry Stout: akin to a smooth and creamy Guinness, with each sip bringing forth waves of bitter chocolate and freshly roasted coffee. “Gestalt” Altbier: bright copper in color and exceptionally smooth, balancing assertive hop bitterness with warm malt character. “Group Theory” Wheat Ale with Chamomile and Honey: despite the addition of syrupy raw honey to the brew, Group Theory has a lovely, dry finish as a result of the fermentation of its simple sugars. It takes its name from a central concept of abstract algebra, which pays homage to both the math background of one of their co-founders, and to their brewery name (a small math reference itself). “Looking Glass” Extra Special Bitter: balanced notes of dark bread, toasted hazelnut, and a robust earthiness. The beer is then lightly hopped with Target and Challenger to accentuate those flavors. “Metric Systems” Gose: this tart German wheat ale is refreshing and light, with notes of orange peel and lemon. “Rabbit Rabbit” Double India Pale Ale: veritable juice bomb, boasting huge hop flavors of mango, melon, and ripe fruit. “Space Monster” West Coast Style IPA: fresh departure from smooth and juicy New England-style IPAs, instead boasting a prominent bitterness and slight sweetness. From that base emerges omnipotent and monstrous flavors of sweet cedar, prickly pine, and ripe pineapple. “Speedwagon” Kolsch: fermented with ale yeast, but then finished in cold temperatures like a lager. The resulting beer exhibits some of the best characteristics of both categories – light and quaffable, with a touch of muted fruitiness and a crisp, clean finish. Find something you’d like to try? No surprise there! 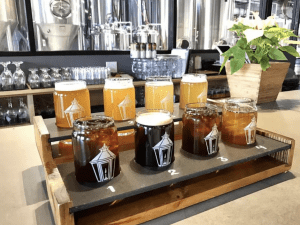 Lamplighter Brewing Co. has something for everyone! Make sure to stop into Mystic Wine Shoppe to pick up one of their brews on the go. If you need another excuse to try them, they hold trivia nights every Tuesday from 8pm – 10pm. Check their website for more upcoming events! 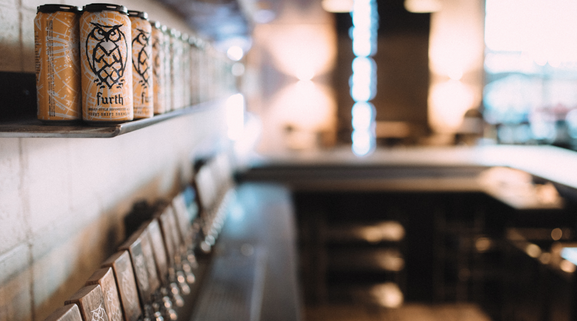 With all the options they have to offer, the fun, funky environment, and the amazing location, make Lamplighter your next brewery must-see and the next pack you pick up from us! http://www.mysticwineshoppe.com/wp-content/uploads/2018/09/lamp4.jpg 810 1500 Eric Faiola http://www.mysticwineshoppe.com/wp-content/uploads/2014/11/Logo_horizontal_2.gif Eric Faiola2018-09-06 13:26:222018-09-06 21:05:50Brewery of the Month: Lamplighter Brewing Co.
Vermont. Land of Ben & Jerry’s, maple syrup and the beautiful outdoors. Also home to The Shed Brewery, one of the first brewpubs in Vermont that has been a state favorite for almost 50 years. History of the brewery: The original building was a blacksmith shop in 1830 that was later served as a cider mill and local gathering spot for farmers. In 1965 it officially became The Shed Restaurant after quickly becoming a local variety store. Local legend has it that when the restaurant burned to the ground and reopened a year later, word spilled out of a new addition of a seven-barrel brewery. This news quickly swept the roads and mountains that English-style, handcrafted ale was going to be produced. Production moved to Middlebury in 2011, and for the first time in the brewery’s history, people outside of Vermont are able to enjoy Shed’s brews. The legacy and history of the original Shed live on in every batch of Mountain Ale and IPA. 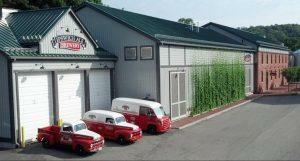 The Shed Brewery offers two year-round brews and three seasonal ones. Their first year-round brew is Mountain Ale-a medium to full-bodied ale, with pronounced caramel and toffee notes, followed by a roasted finish. Their second brew is Mountain IPA- it has handfuls of Simcoe, Centennial and Chinook hops that deliver big notes of pine, resin, and citrus. 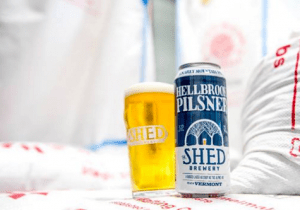 Their first seasonal brew is Hellbrook Pilsner. It is named for the rugged trail that climbs Mt. Mansfield and features a straight-up hop spiciness with a crisp finish. Next is Baltic Porter, a deliciously dark lager that is clean, robust and full of dark chocolate notes with subtle hints of caramel. Lastly, they have their Pumpkin Ale, a bold, balanced and mildly spiced with cinnamon, nutmeg, and cloves. Brewed with organic Vermont pumpkins from the Golden Russet Farm in Shoreham. 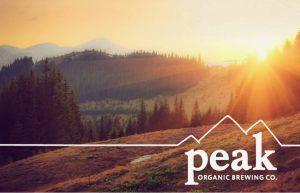 Visit their tasting room in Middlebury, VT (seasonal only). They also have a great pub onsite, so stay and grab some grub with your tasty beer. Guests can learn more about its history and local natives who used to fill the original mill to drink a good cider and spirited conversation. Live too far from the Green Mountain State? 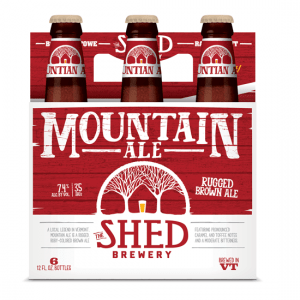 Don’t worry, stop in Mystic Wine Shoppe and pick-up some delicious Shed Beer…. with a little taste of the countryside and history of its Ale, you can drink like a local. Science, art, and love. The three ingredients that created Bent Water Brewery. Located in Lynn, Massachusetts, this brewery got its roots from 3 friends from the North Shore. 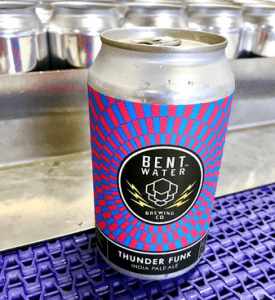 Bent Water’s philosophy is, “Every beer begins with water, and with careful, creative manipulation, we bend water into unique, careful brews.” They are a self-canning, self- distributing brewery with 13 rotating taps in their taproom. And the best part is- they welcome pets on their patio during the warmer months. Good brews, great weather, and furry friends, what more can you ask for? Bent Water offers a very wide variety of brews from IPA’s to Pale Ales and everything in between. They have released an experimental series called the X-Series. There are 22 different batches in this series, that are each brewed differently with their own distinct flavor. Double Thunder Funk Double IPA and Sluice Juice New England IPA. Double Thunder Funk Double IPA: a recreation of the original Thunder Funk, adding more grain and more hops, resulting in more power and flavor. Sluice Juice New England IPA: With aromatics of orange, tangerine and lime peel, this is their juicy, hazy and smooth New England IPA. 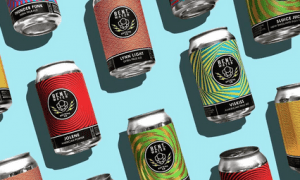 From their bold packaging and can designs to their wildly interesting flavors and brew names, Bent Water Brewery has a lot to offer. With Summer almost coming to a close, if you haven’t gotten a chance to try their X-Series or new brews now is your chance! With one of their 6-pack’s and a good group of friends, your night has already transformed from a good one to a great one. Stop into Mystic Wine Shoppe and shop the Bent Water Brews we carry! Photos from the Bent Water website. What happens when you take three friends, a love for beer, and an interest in homebrewing? 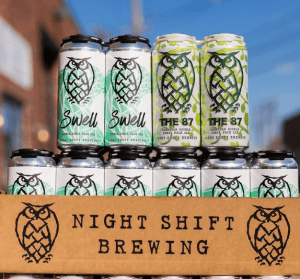 You get Night Shift Brewery of Everett, MA. Founded in 2012 through love and passion, three friends brought their homebrewing to life. In 2007 they began homebrewing in their apartment kitchen. They were desk workers by day, homebrewers by night. They called themselves “Night Shift Brewers“. Next is the a group of seasonal brews called The Rotators. This group is their smaller-batch, limited release offerings crew. They may not always be available, but when they are, they’re worth picking up a pack or two. Looking for a great sour beer? Try their Mixed Fermentation Sours, which are fermented exclusively in stainless steel tanks with both lactobacillus and brewer’s yeast to achieve a high level of complexity and refreshing tartness. Night Shift also offers so many great opportunities to try their beer. Check out their online event calendar, which is filled with tastings, food trucks, and tours. They also hold private events in the taproom. 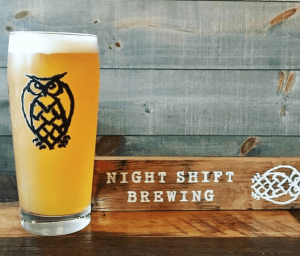 With summer right around the corner, Night Shift is the perfect brew to bring to any get-together, BBQ, or with just a few friends. It’ll sure to be a crowd pleaser. Stop into Mystic Wine Shoppe and check out all the Night Shift beers we have available! It’s almost that time of year again! Warm weather, blue skies, sandy toes, BBQ’s with friends and family. Summer is quickly approaching and what better way to kick it off than with Harpoon’s Summer Ale’s? Harpoon was born in 1986 by three friends, Dan Kenary, Rich Doyle and George Ligeti. They all shared the same love: drinking beer. They realized that beer choices were limited and they quickly wanted to change that. The first Harpoon Ale was brewed in 1987 in a transformed warehouse space on the Boston waterfront. Here, the three friends took their love and passion for beer and created local craft brews for everyone to enjoy. The rest is history. What’s better than enjoying good times with good friends than cracking open one of Harpoon’s summer brews? One of the hardest parts of the craft beer world is deciding which brew to choose. We know- it’s a make or break decision, so we’ll help you try to decide which one is perfect for your occasion. If it were up to us, we’d have them all. Camp Wannamango: This pale ale brewed with mango begins with a subtle tropical aroma of passion fruit and mango. Golden-copper in color, it has a light body, slight hop bitterness, and malty sweetness, and finishes with a kiss of mango. Hibiscus Cider: Hibiscus flowers give the cider its festive, effervescent deep pink hue, as well as a floral tartness that complements the sweetness from the freshly pressed apples. Summer Beer: Their version of the traditional German Kölsch-style ale. This beer, which is light and refreshing, appears to resemble a lager rather than an ale. The body is soft and delicate with a dry, crisp finish. Still unsure of which summer ale you want? 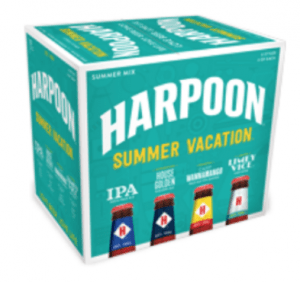 Don’t fret, Harpoon also offers a Summer Vacation Mix Pack. Boston’s Harpoon Brewery has been a standout in the local craft game for years. Stop by Mystic to browse our Harpoon selection, and sit back, relax and crack open a cold one. 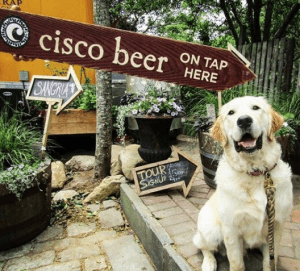 Located on the beautiful island of Nantucket, Cisco Brewery is a must-see when visiting the famous New England Island. 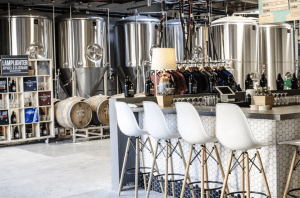 Guests are invited to sip their delicious Cisco beer, enjoy wine from their sister company Nantucket Vineyard, sample liquors from their second sister company, Triple Eight Distillery, and take a tour! It’s truly a great experience. Can’t make it to the island? 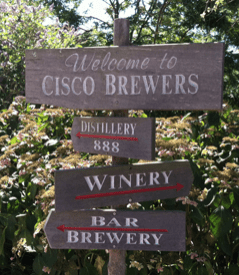 Stop into Mystic Wine Shoppe and shop Cisco Brewery products! 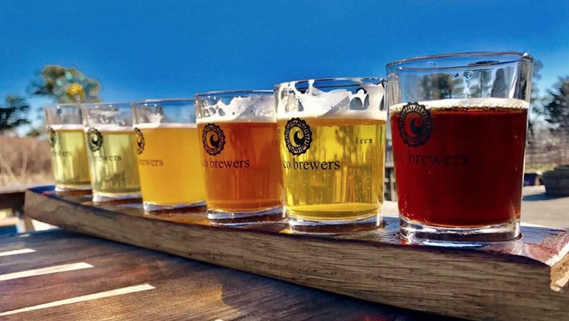 How Cisco Brewers was born: Cisco Brewers was founded by Randy and Wendy Hudson. Wendy started home brewing with some friends while living in California, but in 1992 she returned to the island and met Randy. Instantly, she not only knew that Randy was her soul mate, but that he would make a great brewer. And so she bought him a beer kit. When Randy and Wendy started selling beer, the entire operation-except the cold room, which was cooled by an air conditioner-was outdoors in the backyard. Wendy always called the original setup a “nano-brewery” because although they dreamed about it, they certainly were not yet a “micro.” Many people thought it looked like they were making moonshine and they were right! Cisco Brewers had the distinction of being America’s Only Outdoor Brewery. Whale’s Tale: An amber English-style ale that has a nice balance between hops and malt. It’s the most popular of their beers and the most versatile in terms of pairing with food or people. Sankaty Light Lager: A light American Golden Lager. This delicious creation is light-bodied with tremendous balance and distinct hop character. At 3.8% alcohol and 126 calories, this light beer has true flavor and body while being easy to drink and easier on the waistline. Indie I.P.A: This beautiful red-orange ale has a full malty body balanced by a fruity apricot/grapefruit nose. Mounds of dank Summit hops in the whirlpool and dry-hop additions provide a delicious finish to this East meets West-coast ale. Grey Lady Ale: Named for the often-foggy island where it is brewed. This wheat beer is fermented with Belgian yeast and brewed with fresh fruit and spices. A unique ale that emits a complex, earthy nose and a soft, mid-palate maltiness with hints of tropical fruit. Dry and spicy. 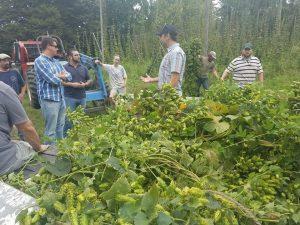 Interested in learning more about Cisco Brewers? They offer tours and tastings for all three of their business’. The tour price includes a tasting glass and you will be able to sample two wines from Nantucket Vineyard, two beers from Cisco Brewery and two spirits from Triple Eight Distillery. Come out and enjoy their Nantucket haven- just prepare yourself in case your mind blows up from all the awesomeness.